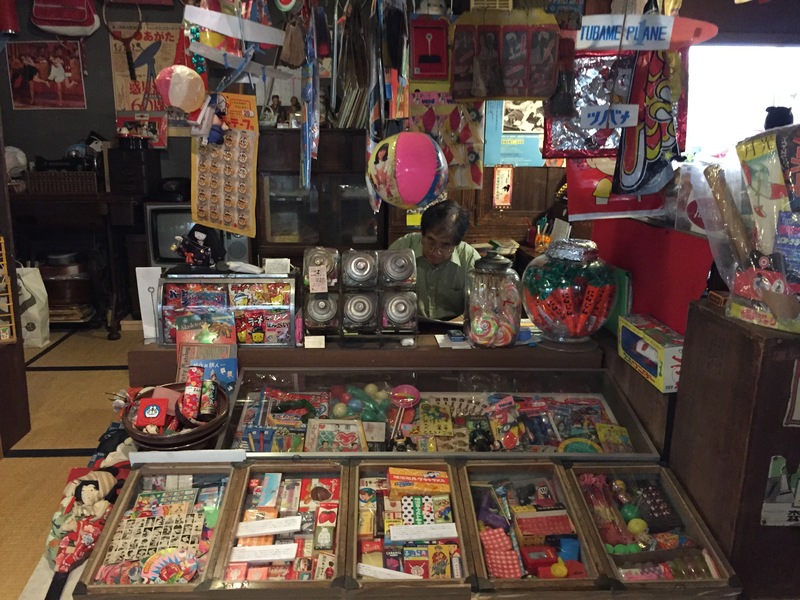 For my first day in Tokyo I wanted to take in some vintage Japan, circa 1950s-60s. I wanted to visit a throwback, somewhere far from the throngs of tourists, which in bustling Tokyo can sometimes be quite difficult. 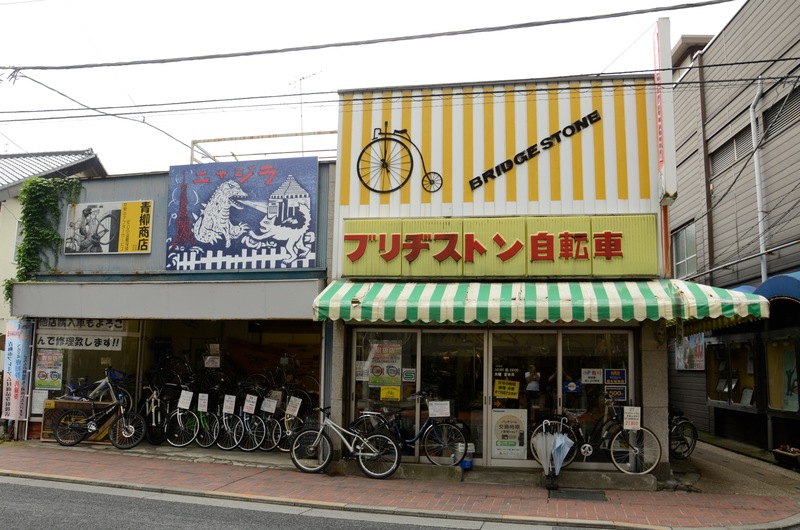 But pre-trip research revealed a city within Tokyo called Ōme that looked like it could fit that retro bill. 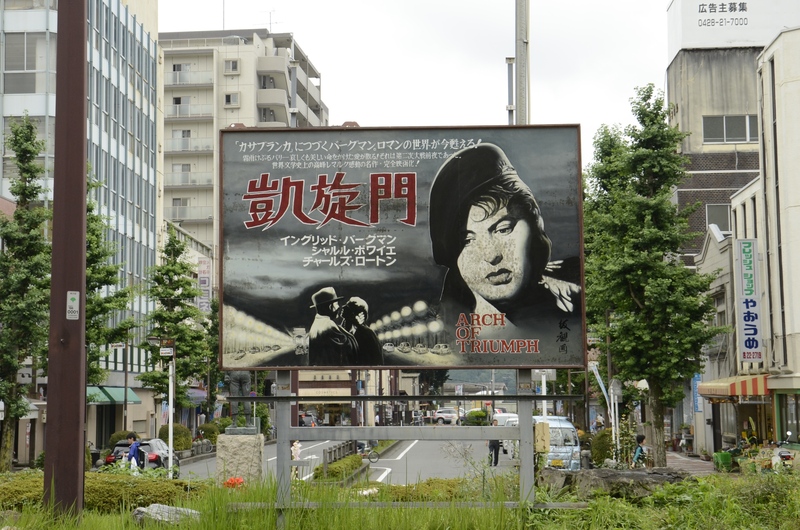 Blogs and websites showed a quiet neighborhood where vintage movie posters lined the streets. I’m interested in the post-1945 Showa period in Japan that ran from 1945 to 1989, an incredibly fertile time for creativity and originality in marketing and advertising design. Typically, Japan put their own creative flair into the “Mad Men” era, and from what I saw online, Ōme looked like it could really scratch that retro itch. So I was happy to find that when it comes to embracing a mid 50s-60s vibe and a genuine old-time Tokyo feel, Ōme truly delivers. 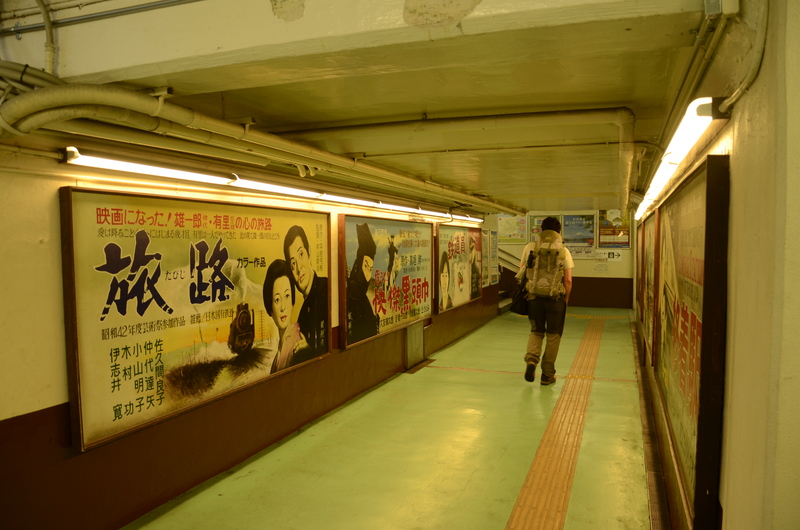 From the moment you pass through the exit tunnel at the JR Ōme Station, you’re immersed in it. 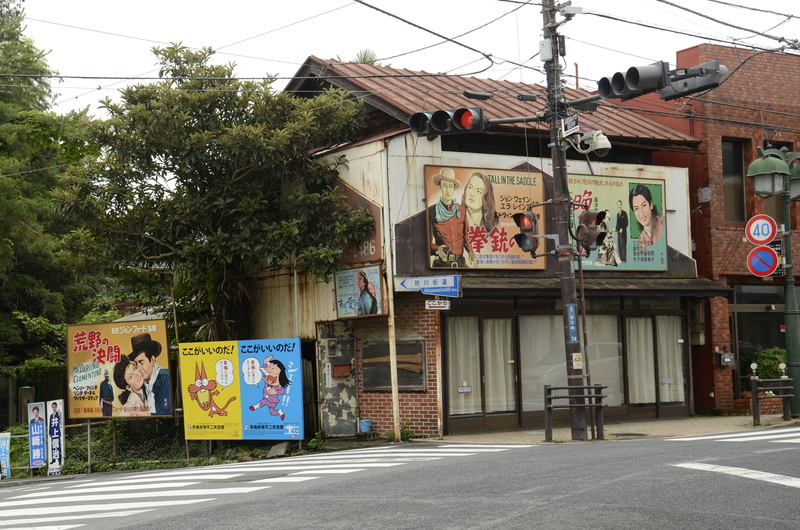 The train station is about a half block from the main drag that cuts through Ōme. Normally I would identify that street, but there were no street signs and post-trip research turned up blank, but you can’t miss it. We took a left on that main thoroughfare because we had some destinations we knew that were in that vicinity. Initially we had no idea what to expect once we got to Ōme … things that look promising online can actually hold limited attraction or appeal or be downright boring. 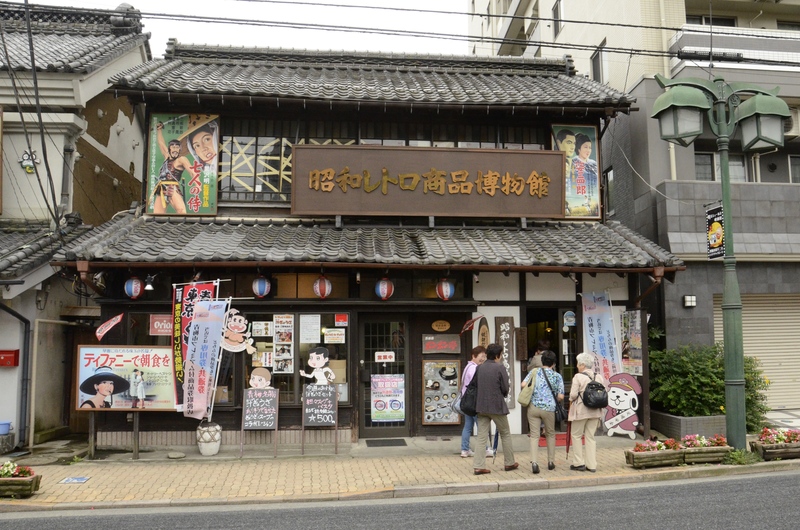 But the small half-mile stretch of the main street held enough fun, interesting, distinctively Japanese things to do and see that what we thought might be an hour-long visit turned into four hours. 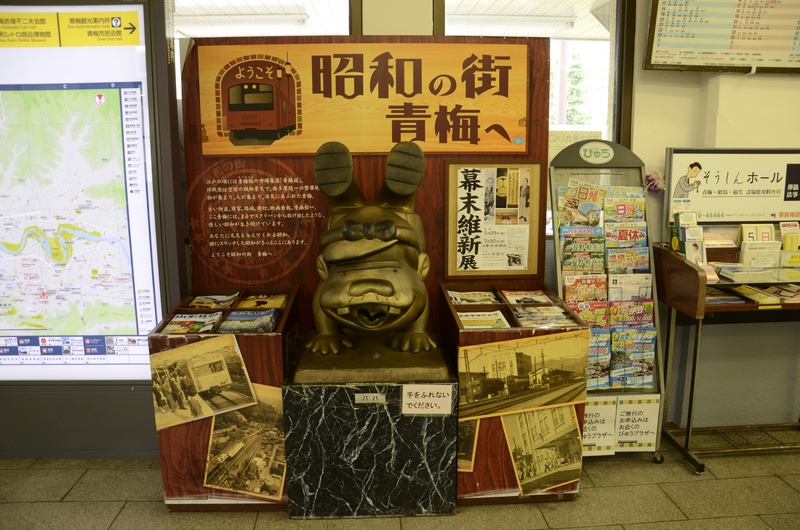 This guy greets you as you exit the JR Ōme Station. 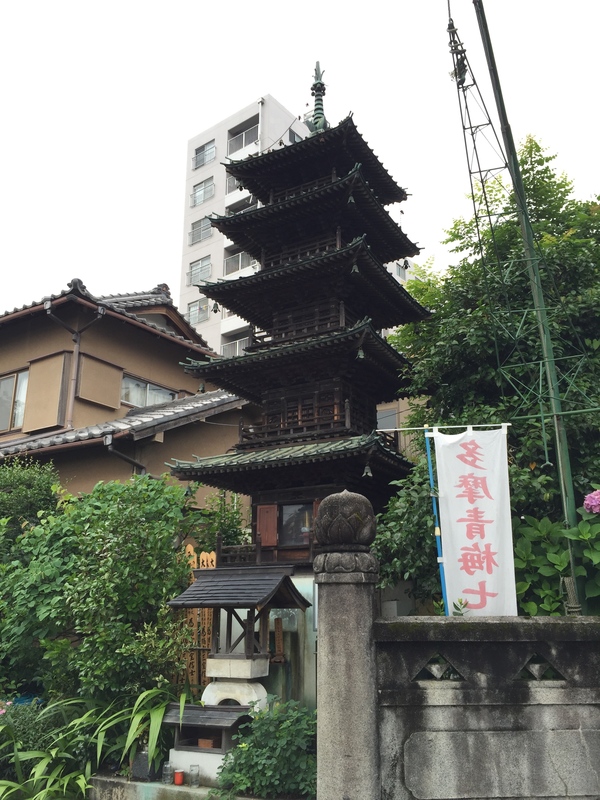 Five-story pagoda in a residential area off the main street. Wooden facades gave the area in warm, rustic feel. 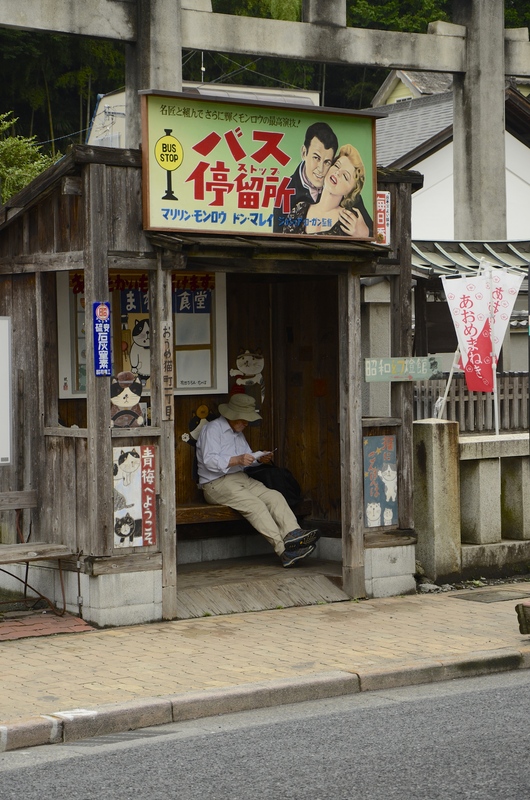 A vintage wooden bus stop that is still in service; the gentleman in the pic is waiting for the next bus to arrive. 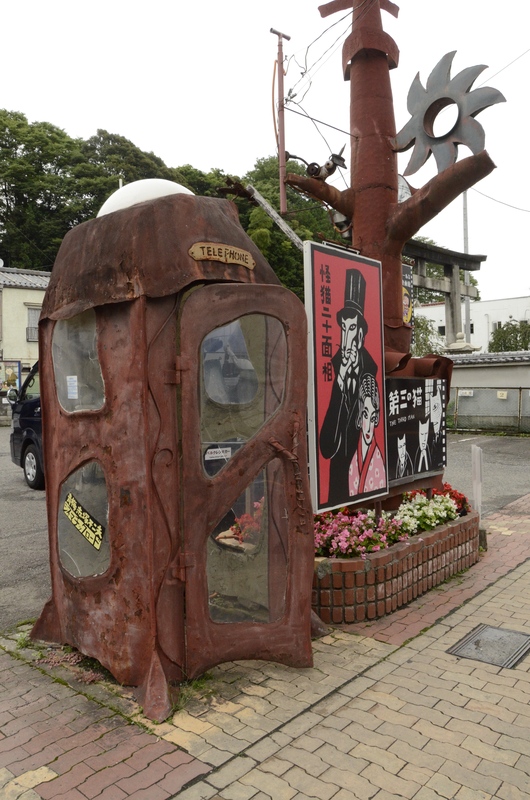 A phone booth that actually works. 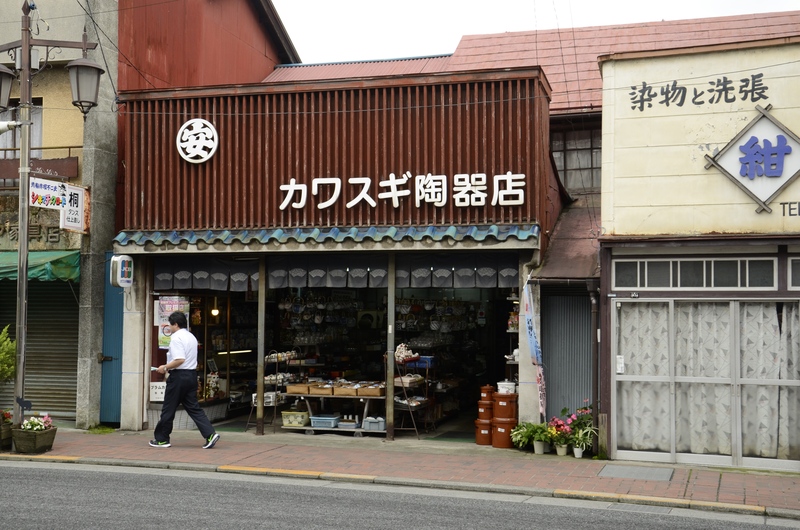 60s-era shops along the main street. 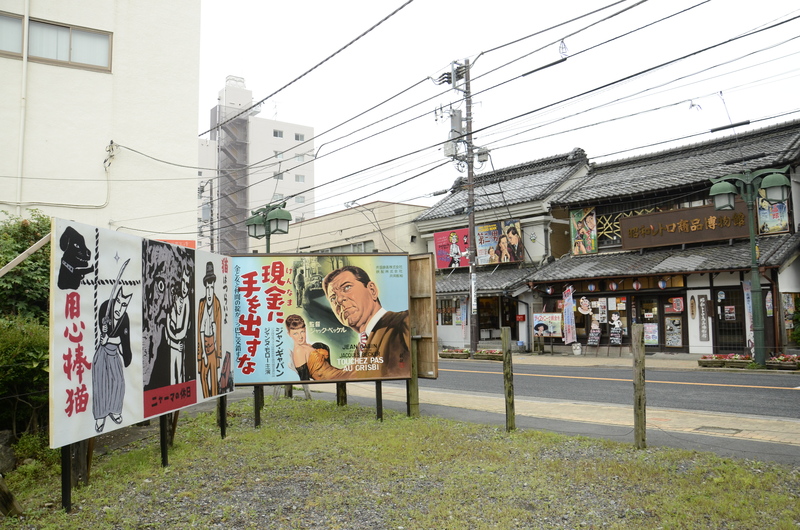 I also soon found that what I had seen online was no exaggeration: true to the city’s reputation, retro movie posters were literally everywhere. Ōme street intersection, about a half-mile from the train station. 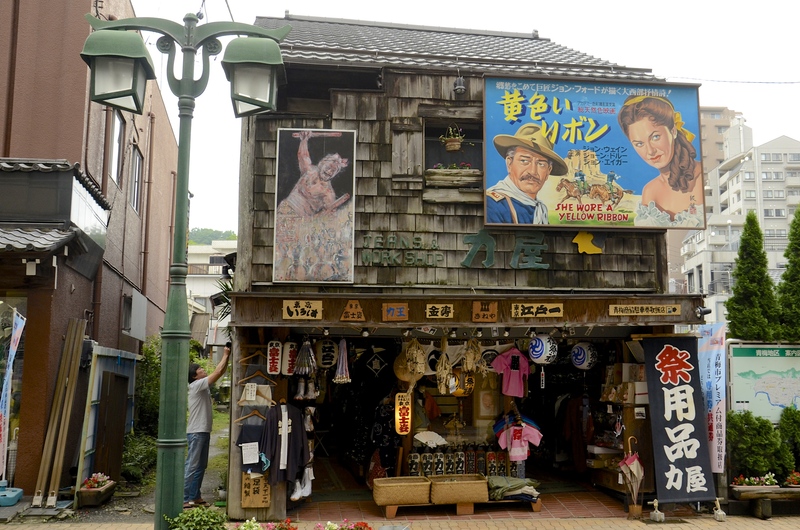 John Wayne in Tokyo: She Wore A Yellow Ribbon above a Ōme shop. 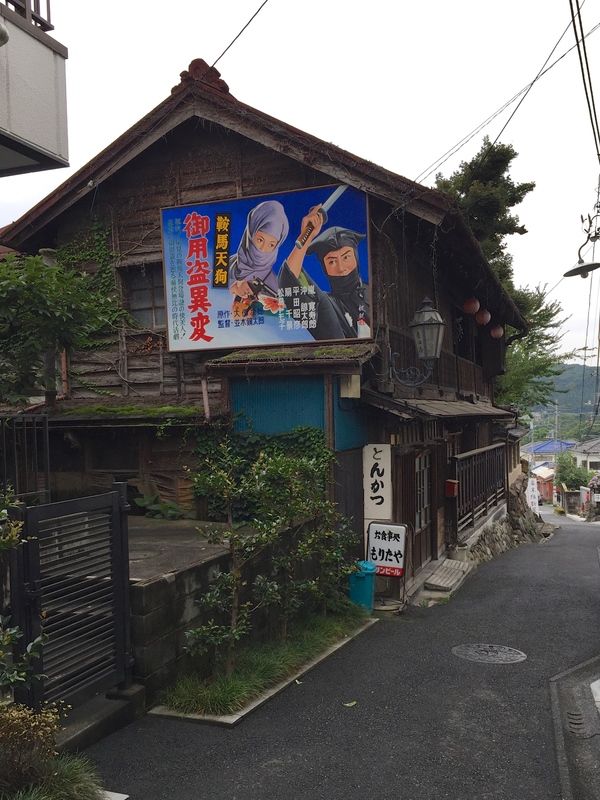 Poster above a side-street restaurant just above a residential area. You can see it from the main drag. This little area had a lot of interesting things to see and is worth exploring. The five-story pagoda in the above pic is also found here. 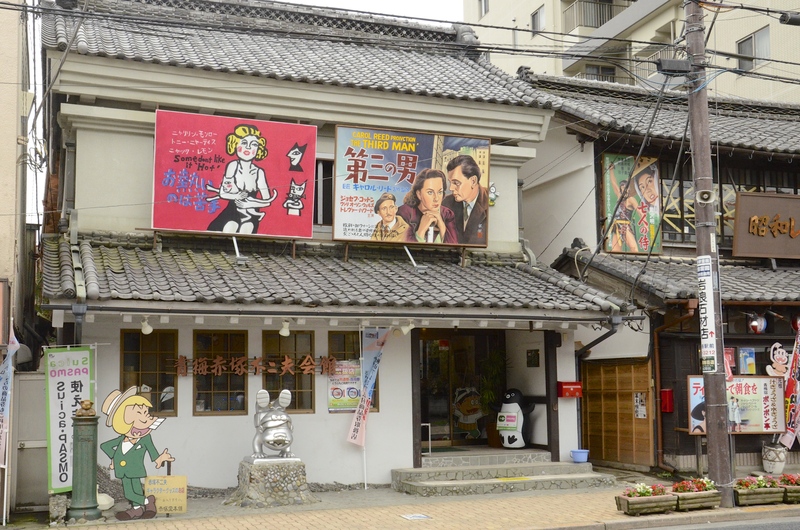 Strolling the main thoroughfare was lots of fun, and we found plenty of cool, fun, surprising stuff, but we had three small museums we definitely wanted to visit, each showcasing a different aspect of Showa era design. 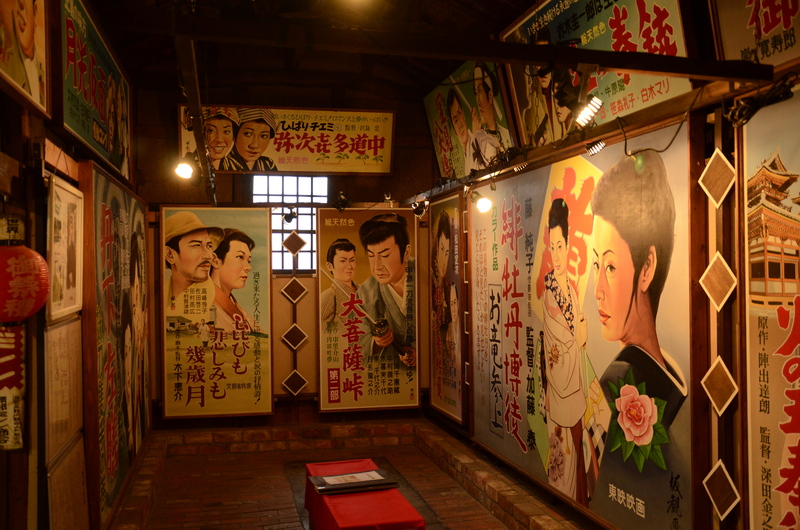 I highly recommend visiting some of these museums should you visit Ōme. 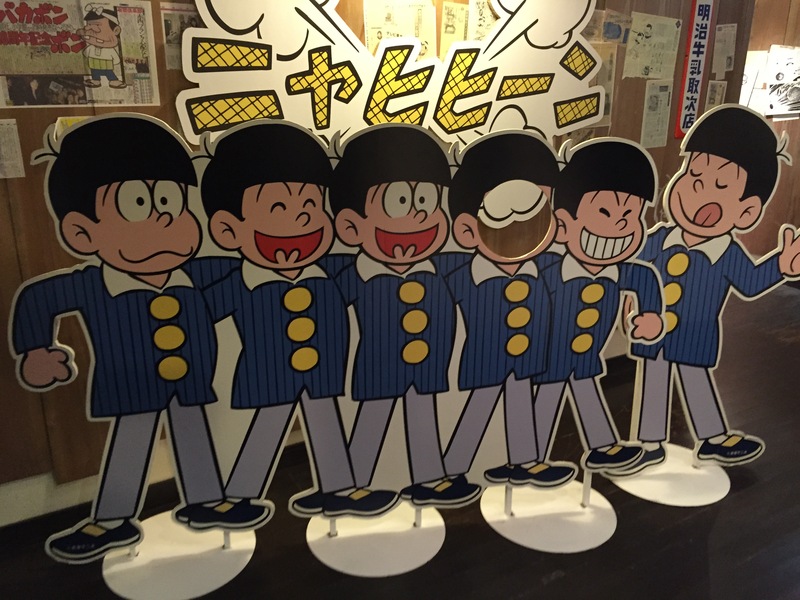 Or why not visit of all of them, as a single ticket for access to all three museums is a bargain at 700 yen. 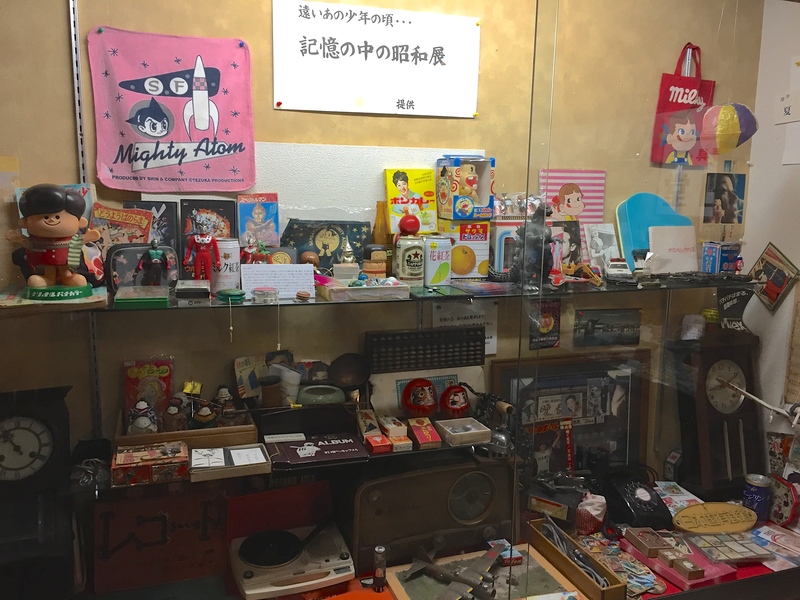 This little museum really packs a lot into small space. 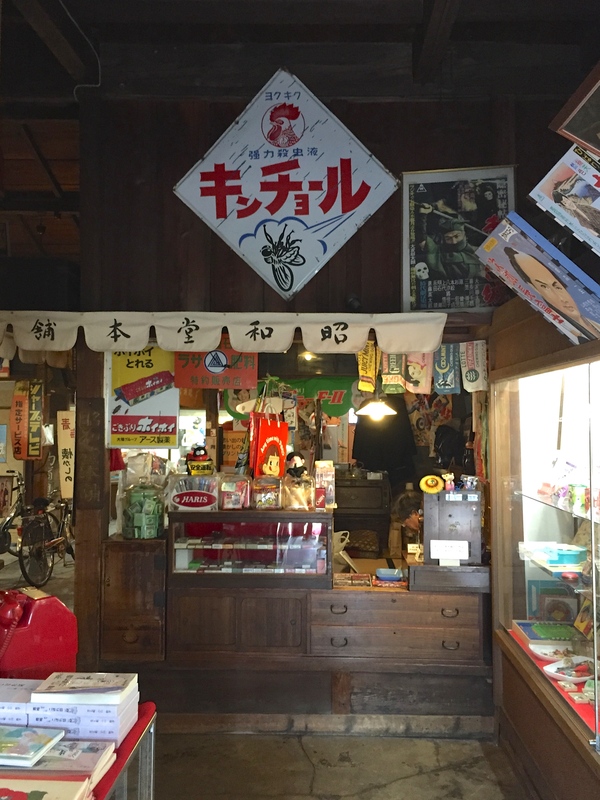 Just a five-minute walk from the station, it boasts an excellent collection of advertising and packaging from the Showa period that I’m a sucker for and this place was a was like being in mid-century kitschy nirvana. Be careful if you take on the staircase to the second floor. It’s really steep and getting down is an adventure … in your stocking feet to boot. The entrance to Akasuka Fujio Kaikan Museum. 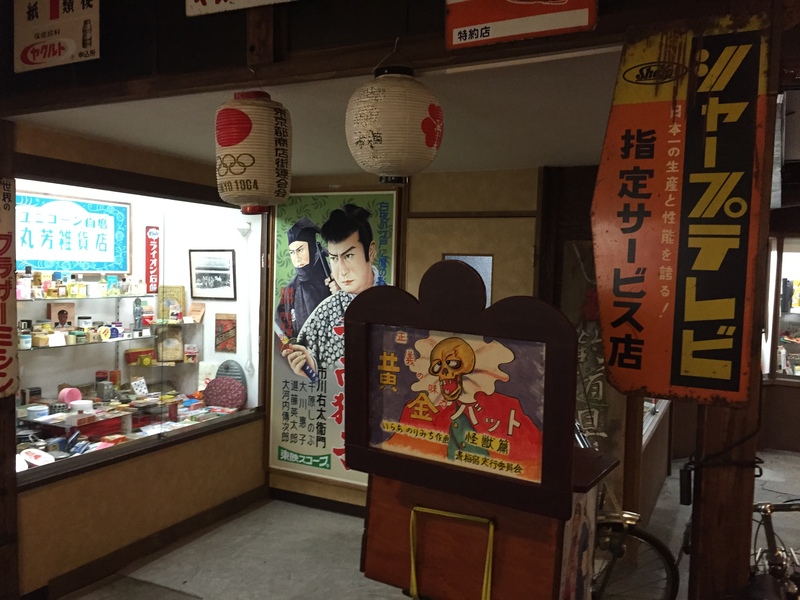 Retro, late-Showa era eye candy abounds in Akasuka Fujio Kaikan Museum! 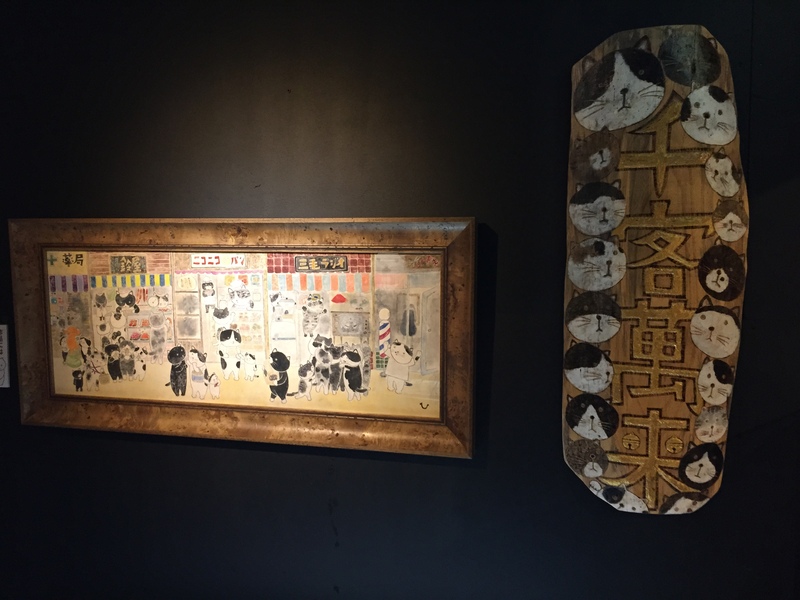 A showcase of some seriously vintage Japanese advertising icons and other pop culture collectible gems from the late-period Showa era. 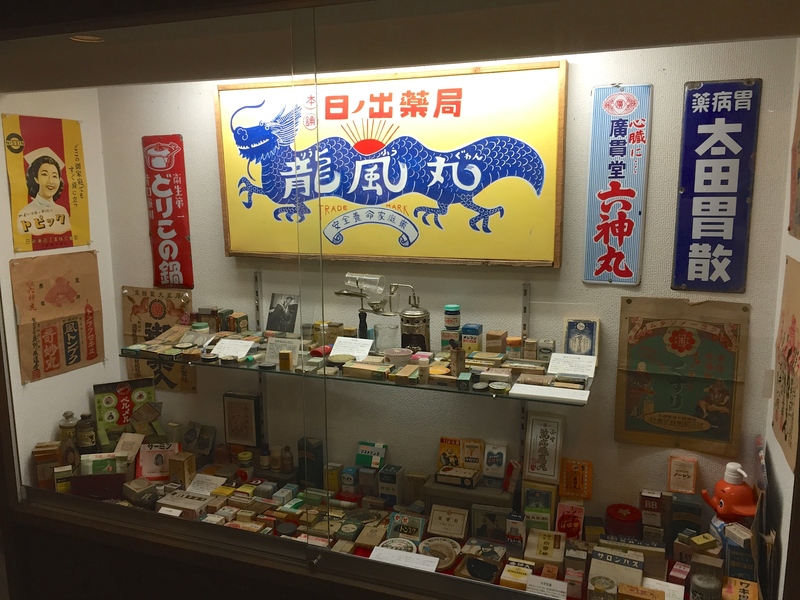 A gallery dedicated to medical packaging and advertising, circa 50s-60s. The gentleman just barely seen behind the counter is the proprietor and that space acts as a counter/office/living space. 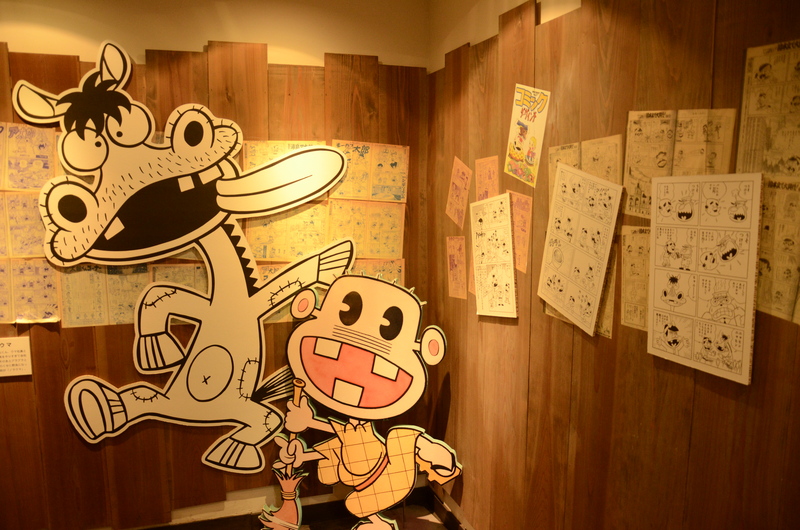 Akatsuka Fujio Kaikan is a museum dedicated to the ground-breaking Japanese manga cartoonist, Akatsuka Fujio (1935-2008), who created the popular manga, “Tensai Bakabon.” The museum displays many things including original work drawn by Akatsuka’s own hand. 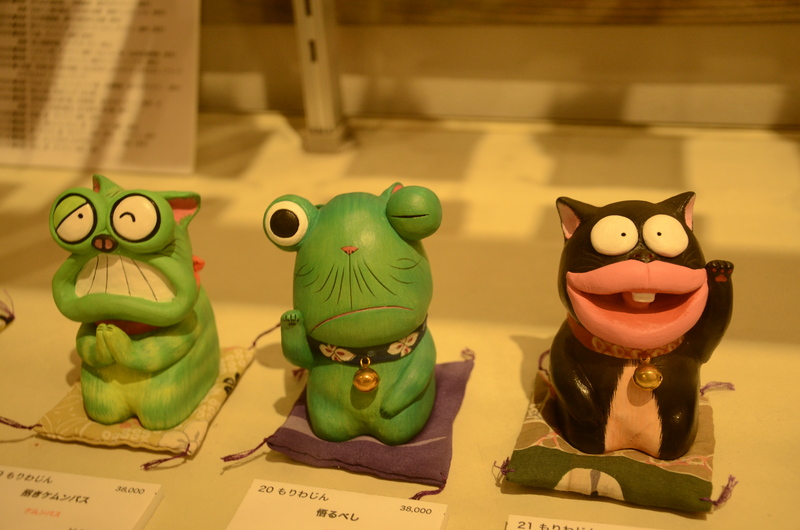 It’s Japanese cutesy to the max and a lot of fun! 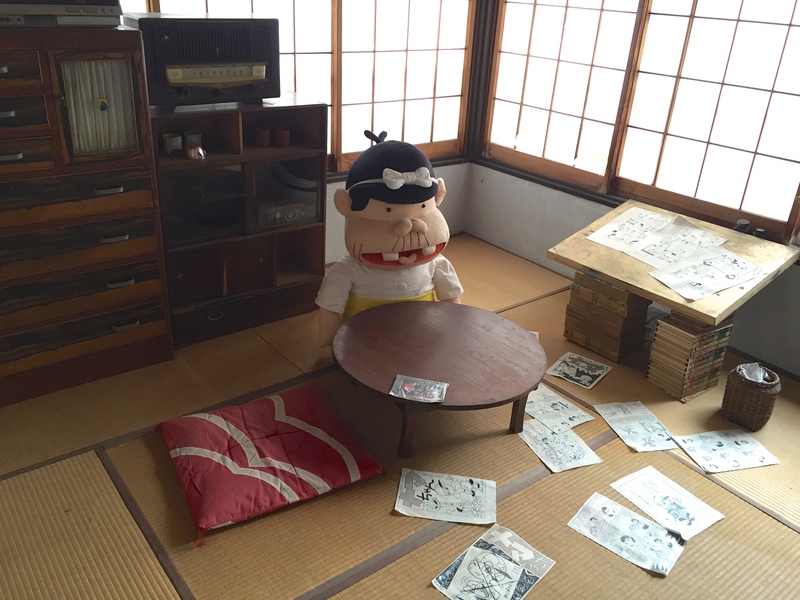 A doll likeness of Akatsuka Fujio with items from his actual workspace. 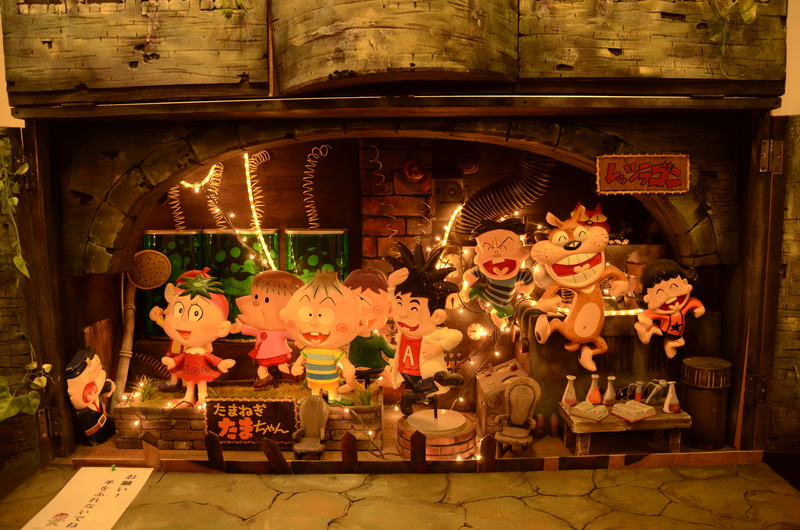 These six characters must have been popular back in the day because they figured prominently in this museum. 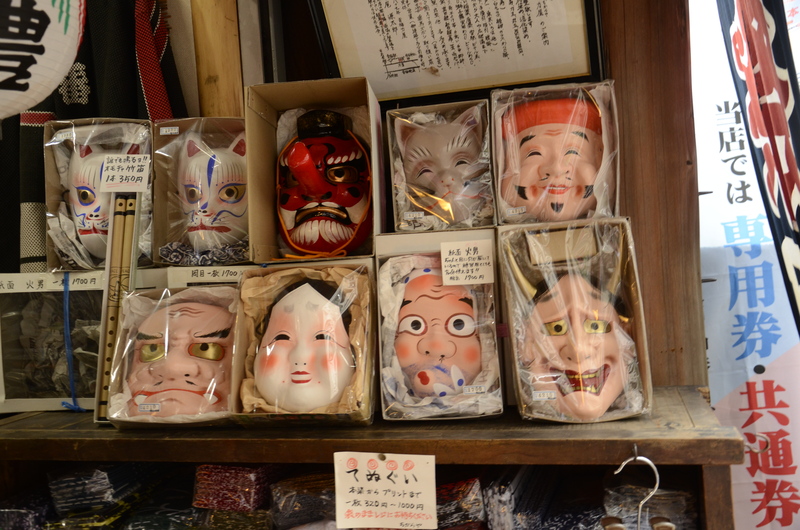 Vintage collectibles of characters from vintage late-Showa era manga. 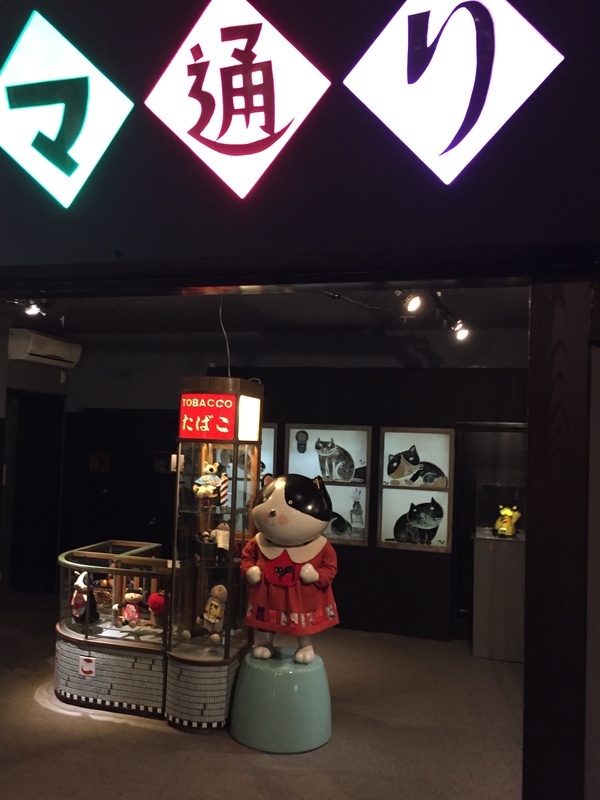 The Japanese love cats, so it was no surprise to find a place dedicated to them. 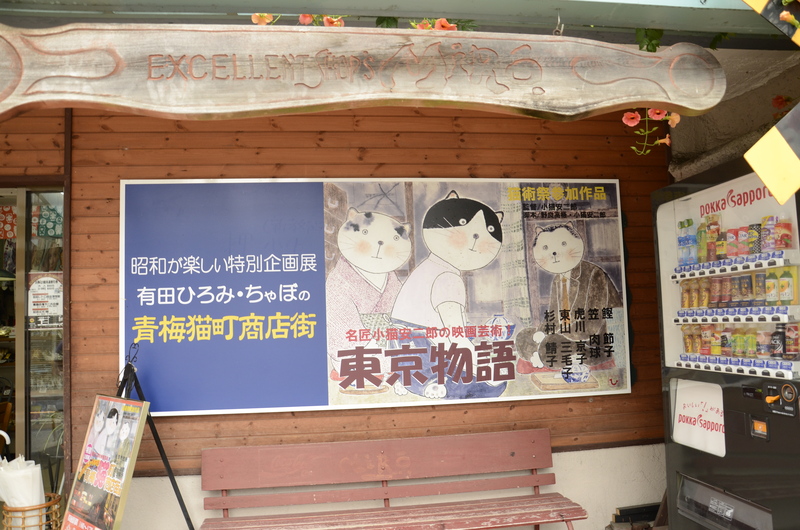 This small museum also boasts a cool collection of dioramas recreating various Showa scenes, many of which involve … you guessed it …cats. If Tokyo were run by cats. 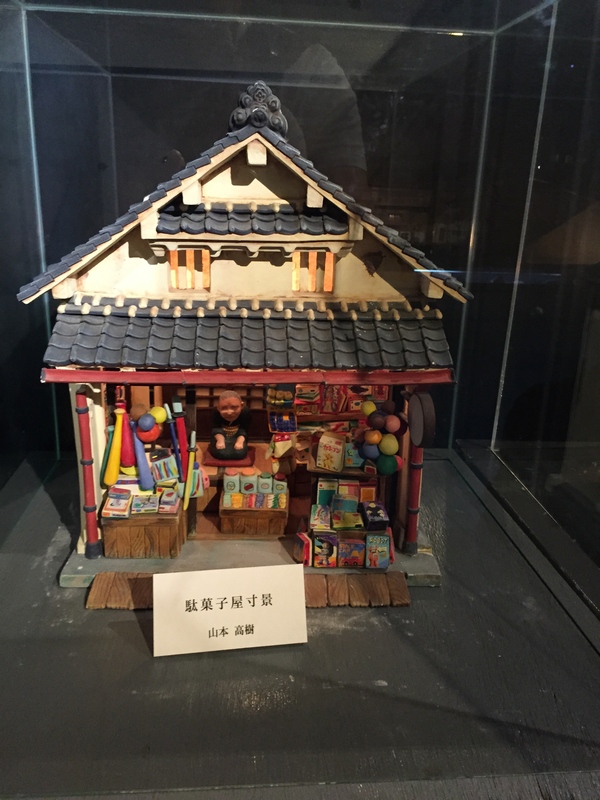 Detailed diorama of a typical early-Showa era Tokyo store. Sign and bench outside the museum. We had other parts of Tokyo we wanted to visit that day, but four hours still didn’t seem like enough time to fully explore Ōme. It’s actually a pretty big place and it has lots of interest places to visit, like the Ōme Railway Park, the Gyokodo Art Museum, the Ōme City Ume Park, a number of shrines and temples, and nature and wildlife tours. So Ōme definitely begs a return visit in my next trip to Tokyo. Getting there: The JR East Ōme Line provides rail service to Ōme. We took the JR train line for the hour-long ride from Shinjuku Station to Ōme. Those leaving Tokyo Station can expect a 70-minute ride. I highly recommend trying to catch the rapid line that cuts down on stops and time. Check out a detailed map of Ōme and vicinity. 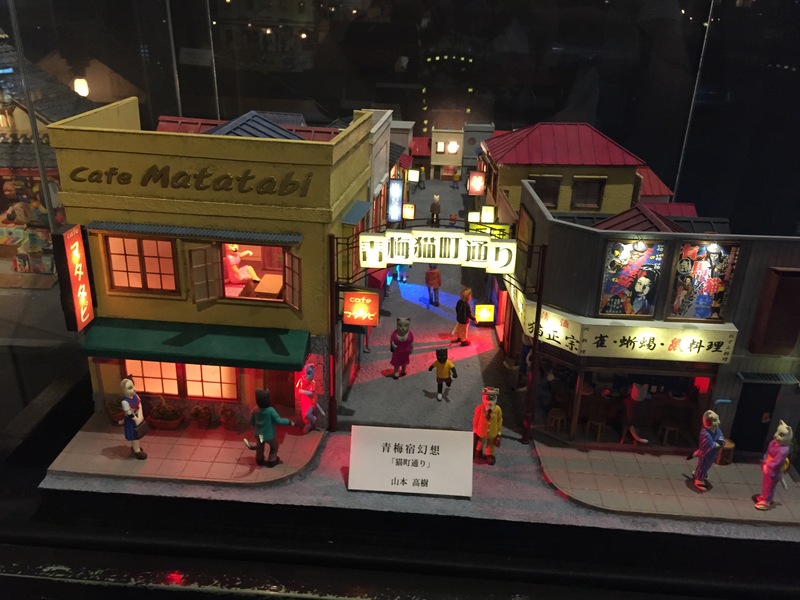 This entry was posted in Essays, Japan, Tokyo, Tokyo On The Go, Travel and tagged Advertising, Akatsuka Fujio, Japan, Ome, Photography, Retro, Showa Era, Stephen Kelly Photography, Tokyo, Tokyo On The Go, Travel, Vintage. Bookmark the permalink. Wonderful travel log, Stephen. 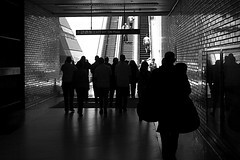 I love the bus stop shot the most. Great post! Hi, Stephen! 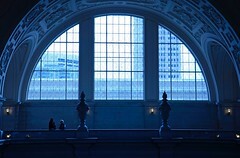 Thanks so much for your wonderful photos and commentary. Were I there in Ome, I think the cat locales would be my first visit. I too love cats. 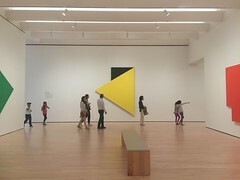 Do they actually have any real cats roaming around in that part of the area, like in the stores and stuff, or is it all art-oriented cats they love? Hi Victoria … if you love cats (like me) you’d love Ōme … representations of cats are everywhere, but oddly enough, I didn’t see any actual cats. Still, wander down an alleyway and it’s a wall-to-wall homage to cats. 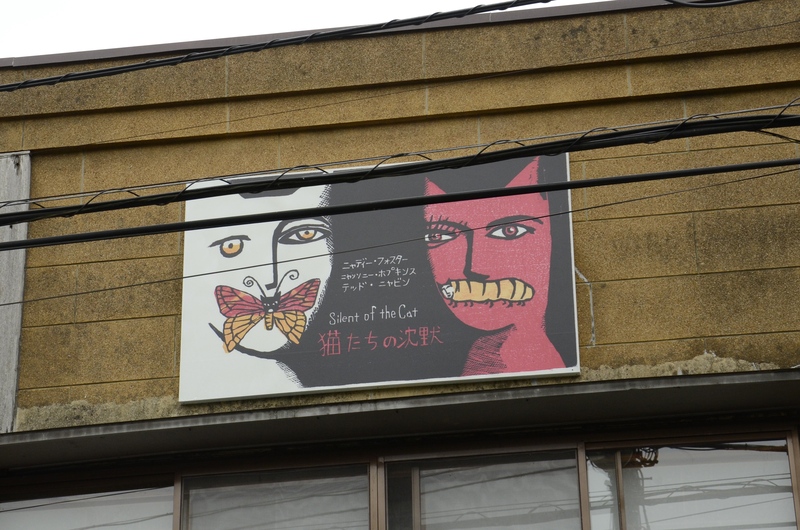 I went to another part of Tokyo called Yanaka that actually calls itslef “Cat-town” that I intend to feature in a future travel post. Glad you liked it! I enjoyed your blog immensely. 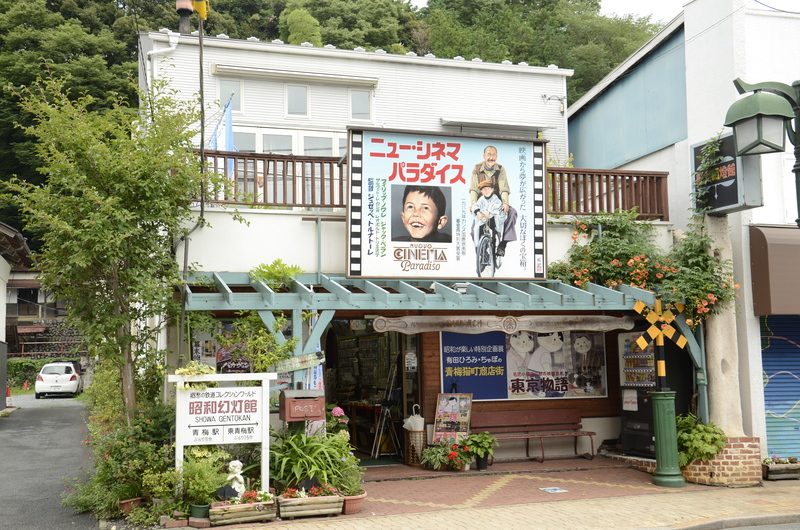 I too liked the Bus Stop shot….especially the poster with Marilyn Monroe’s image…..and the Cat Museum. So interesting!!!! thanks, marie … glad you liked it! more tokyo sites to come!